Cryptozoology: Strange Creature Startles Swimmers in Villaricos. Yesterday afternoon (08/15/13) a strange "carcass" measuring four meters long washed up on the Luis Siret Beach in the community of Villaricos. 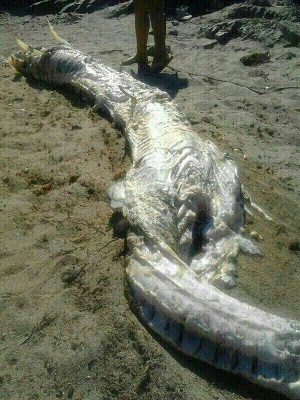 It could be a large fish, but in the advanced stages of decomposition. Once ashore, it was a source of amazement and remarks due to the novelty of the find. The first impression, and the photos circulating on the web, caused many to wonder if that creature belong to "the same species as the Loch Ness Monster". There was talk of a "mutant fish" and a series of humorous remarks. The fact is that Proteccion Civil de Cuevas notified its colleagues at Promar in Pulpí: "We're monitoring the beaches during the summer. A lady found one part and we helped her retrieve the rest. We have no idea what it was. It really stank, as it was in the advanced stages of decomposition. Promar experts are trying to ascertain its nature," explained Maria Sanches, Coordinator of Civil protection in Cuevas.